Accessing the internet is for many Americans now a multiplatform affair. Just a few years ago, the desktop or laptop computers were typical onramps to the internet for the tech-oriented crowd. The digerati, already accustomed to lugging their laptops around in search of ports for their Ethernet cables, rushed to equip them with wireless cards so they could take advantage of WiFi links to the net. Today, the wireless router at home is the center of an untethered online access experience for many Americans that revolves around a range of devices that connect to the internet. The laptop, gaming console, or handheld device may all be connected and in use at once. That’s only the tip of the iceberg for wireless access. Wherever Americans can find a wireless network, whether it is WiFi or one provided by a cell phone carrier, many are apt to take advantage of it for a tweet, text, or information nugget. This report examines how Americans are accessing the internet by wireless means using a range of devices – such as the laptop computer, the handheld device, the gaming console, or e-book reader. It will also update Pew data from a December 2007 survey on mobile access to data and information on a cell or Smartphone. 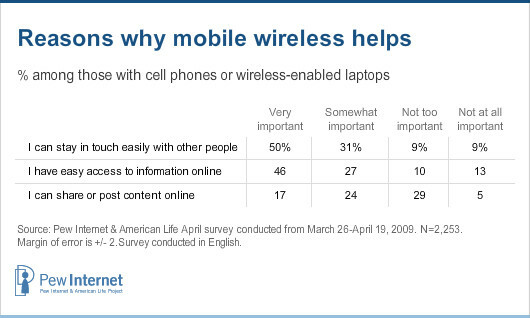 When looking across a range of access devices, the Pew Internet Project’s April 2009 survey finds that a majority of Americans – 56% – have used at least one of them to go online using a wireless network. 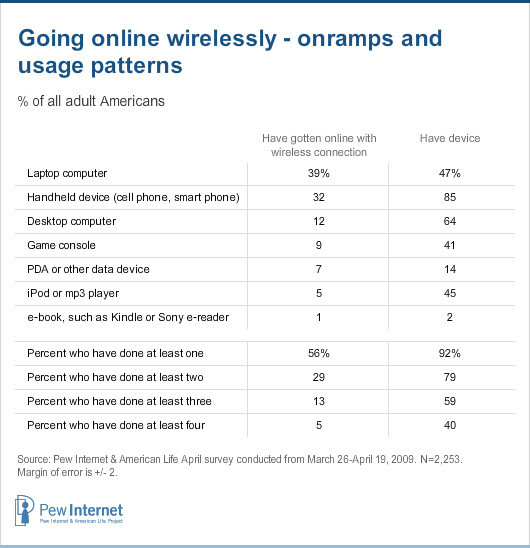 Another 24% of Americans are internet users, but say they have never gotten online wirelessly; the remaining 20% of adults are not internet users. Needless to say, people take advantage of a variety of devices to put wireless networks to use, and some have more than one way to access the internet wirelessly. At a high level, the data show that there is a gap between the share of people who has a device capable of accessing the internet and those who do. 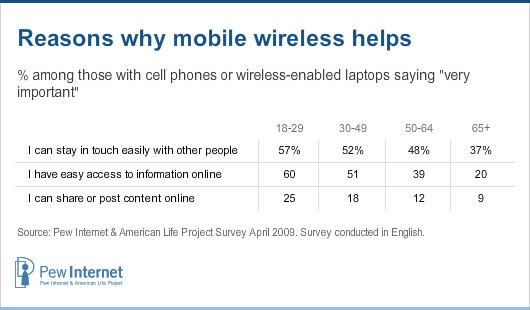 Some 92% of adult Americans have at least one device listed above, but the April 2009 survey shows that 80% of adults are online users. Even among the 78% of adults who have a desktop computer or a laptop computer, a small share (6%) does not use the internet. Each of these access modes has its own contexts and usage patterns. The emergence of wireless networks – either at home or in public places – helps explain the small gap between those who have laptops and those who have used them to go online wirelessly. Not all Americans have cell phones that easily (or at all) permit online access, and 3G networks that make that feasible are not ubiquitous. That, in conjunction with the fact that handheld online access still seems to be the province of tech enthusiasts, helps explain the gap between those who have cell phones and the incidence of using them to get online. Other devices – such as the iPod, game console, or e-book – have a dedicated purpose and, for now at least, users seem content to get online with them infrequently. Desktop wireless access is little different from tethered access for the user and happens, in all likelihood, because the user’s desk at home is not close enough to a physical connection to a modem. The bulk of the report will explore the two primary ways people use to access the internet by wireless means – the laptop computer and the handheld device (i.e., the cell phone or smart phone). These are not, quite obviously, mutually exclusive sets of people. Some 45% of Americans have a laptop and a cell phone and 19% have gotten online at some point with a laptop and a handheld. Fully half of all Americans (51%) have gone online wirelessly either with a laptop or a cell phone, meaning these users make up the vast majority of Americans who have used the internet over a wireless network. When cell phones first gained widespread currency among Americans, they were often thought of as a safety valve for communicating with others. Running late? The cell phone could at least let you get the word to the party waiting. Now, with the capabilities of the cell platform expanding, so are the reasons for which people value the device. When those with a wireless-enabled laptop or a cell phone were asked to think about what is most important about having those devices while they are away from home or work, here is what they said. It is clear that people still value the capacity to stay in touch as very important part of what the cell phone offers. At the same time, though, nearly as many say that easy access to information is crucial to them as well. Finally, Twitter and content-sharing looms large for some mobile users. One in six (17%) say they see posting or sharing content as a very important dimension to mobile access. The 11% of online users who have Twitter accounts or monitor Twitter updates are twice as likely as the average to say that sharing or posting content is very important to why they value mobile access. Not surprisingly, younger Americans are more likely than others to see each of the three dimensions of mobile access as very important. In the 18-29 age group, access to information on the go rates a bit higher than staying in touch with others as an important feature of mobile connectivity. There are also clear differences in attitudes about mobile access across racial categories. With African Americans being very active in texting and IM-ing, it is no surprise to see them in the lead in viewing mobile access as a way to stay in touch with others. African Americans also are more likely than whites to see mobile access as a way to share content with others while on the move.